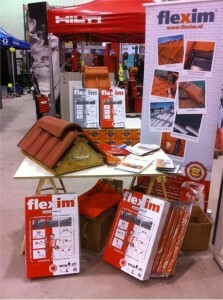 At the Salon de l’Outillage of the Plateforme de Bâtiment of Villeneuve la Garenne our stand for the roof mortar Flexim® that can be used even during the current cold wave. Application is possible with temperatures up to -25° C, Flexim is the ideal product for repair and sealing works of your roof with any weather conditions! For more information about the application possibilities, please refer to our product page.